Police in south suburban Matteson took 36 people into custody after a shooting and standoff at a house party early Sunday morning. MATTESON, Ill. (WLS) -- Thirty-six people were arrested after a house party turned into a standoff with police in south suburban Matteson. Police responded to reports of shots fired in the 900-block of Princeton Avenue just before 3 a.m. Sunday. Investigators learned the gunfire stemmed from a house party being held at the property. Between 15 and 20 people were initially detained. Officers found 30-40 shell casings strewn up and down Princeton, as well as on the ground surrounding a rental property. Two handguns were recovered from the area. Witnesses told police they saw a black Charger driving away from the scene. Officers pulled over a vehicle matching that description on Route 30 near Willow Road. Two people were arrested. Two handguns were recovered from the area where the vehicle was stopped. Police said several people inside the rental property refused to exit the building. They barricaded themselves inside for about three hours. Officers obtained a search warrant and called the South Suburban Emergency Response Team to the scene just before 8 a.m.
A few people surrendered. Others still refused to leave. 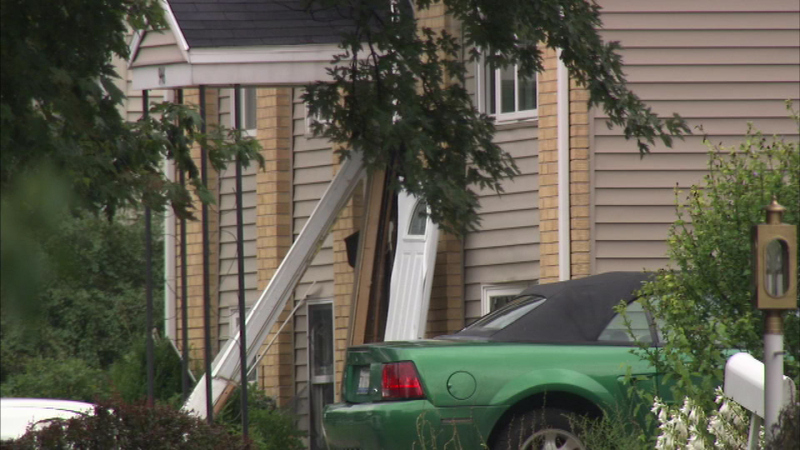 Police said the SSERT used a Bearcat to break down the door. The people inside were taken into custody. After authorities completed their investigation around 1 a.m. Monday, building department officials said the residence was deemed uninhabitable because of possible structural damage. It was boarded up.